Acclaimed singer Liza has never looked back since she won the Close Up 1 talent hunt. Singing is her forte but she has also emceed programmes. 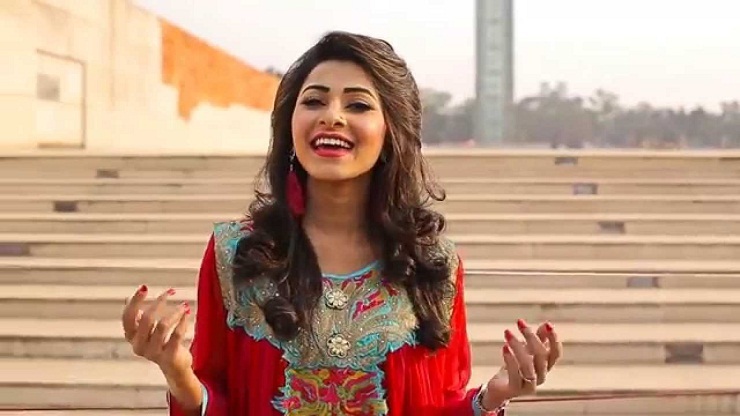 In play-back, Liza started her career in the title song of Shahin Kabir Tutul directed movie Ei To Bhalobasha along with Tausif. Later she gave her voice for several other play-back numbers. But she rendered only one song in each movie. For the first time, Liza gave her voice for all the play-back songs of a movie. She has already given her voice for two songs. She will give her voice for rest two next week. Liza gave her voice for Kashem Mondal directed a horror movie titled Pretatma. There will be four songs in the movie which lyrics were written by director Kashem Mondal. SD Babul has coordinated its music. Liza has finished two play-back songs which were: Tumi je aamar kachhey sobcheye dami and E jibone ami shudhu tomai cheyechhi. “Everything is going well and I'm now eagerly waiting for its release. The album will hopefully entertain the music lovers,” she said. It is to be noted that Liza has two solo albums in the markets. One is Liza Part-1 and another is Pagli Suraiya. Radhika Apte earns new fanbase in China with super success of AndhaDhun!